The most comprehensive store of information on construction projects in North America, with more private and early-stage projects than any other source. Comprehensive, confidential, and continuous subcontractor prequalification and due diligence to simplify the process of finding the right subcontractor. Gain at-your-fingertip access to valuable construction market data and competitive intelligence to improve planning and make more informed decisions. Dodge provides detailed construction forecast and trend reports down to the specific market or market segment level. Get Dodge construction project data when and where you want. Feed your business the best construction data and watch your business grow. Dedicated to construction research, Dodge Data & Analytics gets you the answers that no one else can. Sweets is the building product information source for the entire project team. Architects, designers, engineers, contractors and owners can easily research, compare and select the best products for their needs. Dodge PipeLine combines the most comprehensive source of information on construction projects in North America with the tools to find and win the next job. Puts the industry's most comprehensive source of construction project leads directly into your CRM system for faster, more efficient selling in the construction industry. Faster and more efficient selling. Put construction project leads directly into your Dynamics CRM with Dodge PipeLine for Microsoft® Dynamics® CRM. Dodge PlanRoom provides a single, secure location for contractors and sub-contractors to share and manage plans, specifications, and other construction documentation and information from the bid phase through to project completion. The study findings in this SmartMarket Insight reveal the challenges that contractors face in conducting risk management activities and demonstrates that they are optimistic about the potential for emerging technologies to help address risk. 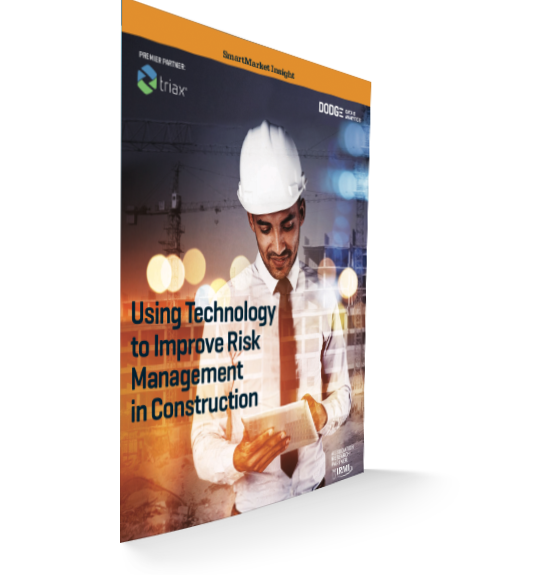 The study shows the challenges contractors face with conducting several broad risk management activities, and how engaged they are with using technology now for various risk management activities. It also reveals the top project risks that contractors think can be addressed by IoT (Internet of Things) technologies like wearables and sensors. The main influences on contractors’ decisions to invest in technology are also highlighted, including how those investments are funded, the key obstacles to getting decision-makers to agree to invest and the top benefits contractors expect to achieve from use of these technologies. Please provide a few details, and then you can access all our content. Thank you for your submission. You are now subscribed. Thank you for your interest. We will reach out to you shortly.